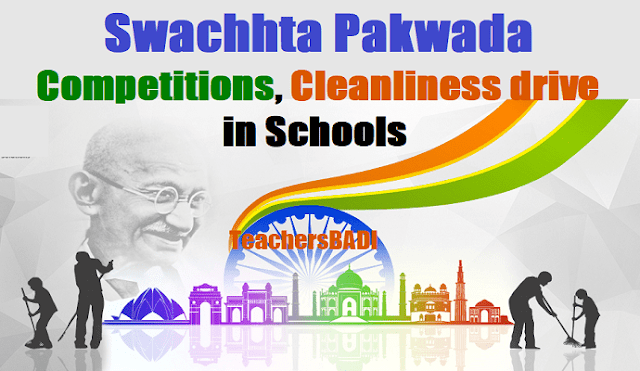 Essay, Drawing, Slogan making competitions,Cleanliness drive in Schools under Swachhta Pakwada: Essay Competition, Drawing/Poster Competition/Rally/Slogan making competition and Cleanliness drive etc in Schools for observing the Swachhta Pakwada from 1st to 15th September, 2017. Pledge of Swachhta Pakhwada programme on the first day of Swachhta Pakhwada programme everybody in the school. Swachhta Shapath Day on 1.9.2017: Swachhta awareness message to be posted on the website of the Department/Organisations/Schools. Swachhta Shapath function may be organised on very first day of the Pakhwada i.e. 1st September, 2017, wherein all students and teachers/staff may participate. Class exercise, where every child will promise to take up one activity for personal/ school/ community/ home cleanliness. 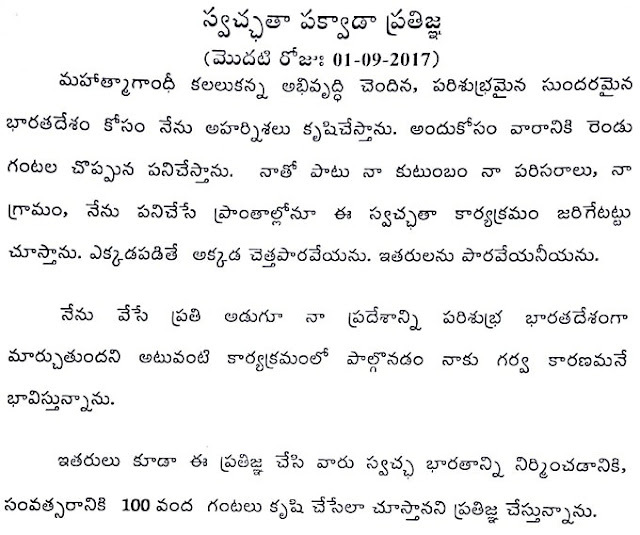 C and CDSE - Rc.No.3069; Dated: 4.09.2017 :: Sub: SE (Progs.I) TSSA - To conduct the Essay Competition, Drawing/ Poster Competition/ Rally/Slogan making competition and Cleanliness drive etc in Schools for observing the Swachhta Pakwada from 1st to 15th September, 2017 - Reg. Read: Govt. Memo No. 6652/SE-Prog.I/2017-1, dated 29.08.2017, along with DO letter No. 27-08/2014-EE. 16, dt: 24.08.2017 of Joint Secretary GoI, MHRD, Dept of School Education & Literacy, New Delhi. Memo. No.6652, Date: 29.08.2017 :: Sub:-SE(Prog.I) - TSSA - To conduct the Essay Competition, Drawing/Poster Competition/Rally/Slogan making competition and Cleanliness drive etc in Schools for observing the Swachhta Pakwada from 1st to 15th September, 2017-Reg. Ref:-From the Joint Secretary, Gol, MHRD, Deptt.,of School Education & Literacy, New Delhi, D.O.No.27-08/2014-EE.16, dt:24.08.2017. A copy of the reference cited is herewith sent to the Commissioner and Director of School Education, Ex-officio, State Project Director, SSA, Telangana, Hyderabad and he is requested to look into the matter personally and conduct the Essay Competition, Drawing/Poster Competition/Rally/Slogan making competition and Cleanliness drive etc in Schools for observing the Swachhta Pakwada from 1st to 15th September, 2017. D.O.No.27-08/2014-EE.16, dt: 24.08.2017 :: Rotary India have requested to this Department to join hands in creating awareness about cleanliness in schools during the Swachhta Pakhwada from 1st to 15th September, 2017. This Department has already issued detailed suggestions vide letter dated 19th May, 2017 and action plan vide letter dated 1st August, 2017 for observering the Swachhta Pakhwada from 1st to 15th September, 2017. .
3. State-wise number of schools proposed to be covered by Rotary India Literacy Mission is enclosed. WINS & RILM have together committed to take up the above activities in 25000 schools. State may further ask for details of schools where they will carry out the activities during the Pakhawada. 4. May I request you to cooperate with the Rotary India in their endeavor towards Swachhta in schools and necessary instruction may accordingly be issued to facilitate them. I take this pledge that I will remain committed towards cleanliness and devote time towards this. I will devote 100 hours per year that is two hours per week to do voluntary work for cleanliness. I will neither litter nor let others litter. I will initiate the quest for cleanliness with myself, my family, my locality, my village and my workplace. I believe that countries that appear clean are so because their citizens don't indulge in littering nor do they allow it to happen. With this firm belief, I will propagate the message of Swachh Bharat Mission in villages and towns. I will encourage 100 other persons to take this pledge which I am taking today. I will make them devote their 100 hours of cleanliness.